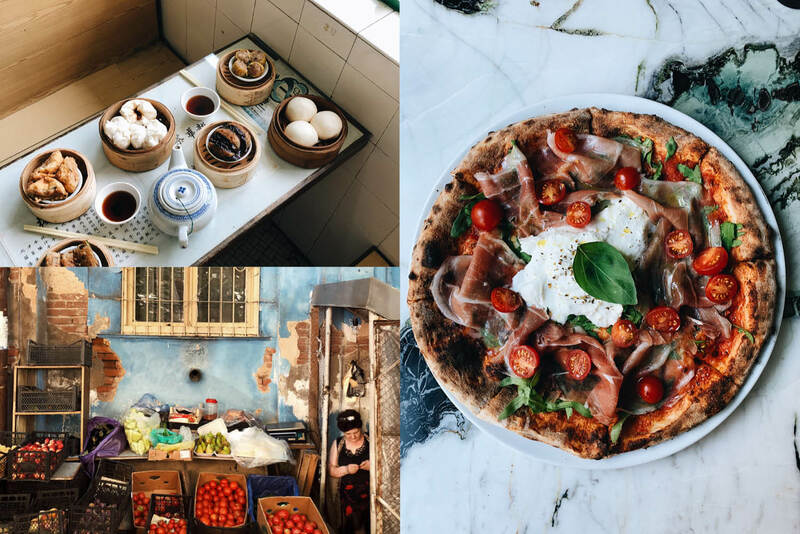 Some of the incredible food from around the world you can see on the @food_feels Instagram account. Image via James Thompson. There are countless travel accounts on Instagram. But there are other ways to see the world through Instagram’s lens. Here, six accounts that will take you on a visual world tour of a different kind. How do you while away the hours on Instagram? For me, it’s a haphazardly curated feed of beautiful destinations, coveted fashion, mouth-watering food and Betoota Advocate LOLs. I want to go there, wear this, eat that. Sure, I’m envious, but I try to keep the green-eyed monster at bay by striking a content balance. Exotic locations, oui. Nothing but exotic locations, non. To that end, here are six accounts that will nourish your wanderlust while injecting some less traditional imagery into your feed. Humans of New York has over eight million followers. I mean, you’re probably one of them. This is a hugely popular account. @humansofny started life as Brandon Stanton’s photography project in 2010 and, although it has evolved since, it remains true to its original mission: to provide a glimpse into the lives of everyday New Yorkers. While the account still predominantly features locals – it would be weird otherwise, right? – it now goes on tour, too, giving followers an insight into lives around the globe. More than four million Instagram posts have been tagged #lookup, a nod to the notion that we should pull our eyes away from our phone and enjoy what’s around us. (Hashtag irony.) But, as this account proves, we should be doing more looking down as well. @ihavethisthingwithfloors is the result of three friends realising they all, err, had this thing with floors. They curate the account from Amsterdam, but share ‘selfeets’ (selfie meets feet, geddit?) from all over the world. Each features an Instagram-worthy floor – think beautifully patterned tiles, confetti covered dance floors, colourful carpets – underneath a pair of feet. Bonus points for cute shoes. If you’ve never posted a photo of your cool takeaway coffee cup, are you even on Instagram? Kiwi photographer Henry Hargreaves has taken the trend a step further, curating an account dedicated to, as the handle would suggest, @coffeecupsoftheworld. The account started with Hargreaves’ personal assortment of cups collected during his travels, but has since added submissions into the mix. The result is a striking visual ode to cafes that have turned a ubiquitous item into a work of art. The first thing you should probably know is @AKS “is not a f**king street style blog.” Adam Katz Sinding is a fashion week documentarian. The American born, Copenhagen-based photojournalist travels 300-plus days of the year, capturing the world’s biggest fashion events from both backstage and the street. The disclaimer is his. He says street style is a lie he wants no part of. In contrast, Katz Sinding’s images are an honest snapshot of style in some of the world’s most fashionable cities, and a touristy #ASKforeheadselfie series for good measure. “Behind every door is a story,” says Caryn Cullinan, the woman behind The Door Project. That might be true, but @thedoorproject is more about the door itself with colourful, ornate and quirky examples from around the world captured via the Instagram account. The project has its roots in a 2015 Kickstarter campaign, which aimed to raise enough money for Cullinan to publish a book. She did that, but hasn’t stopped the door hunt, which she documents on Instagram. While her captions include little more than each door’s location, the absence of the aforementioned ‘story’ does allow you to imagine your own. Ahh, there’s a small pizza, I mean, problem. Sorry. I have been scrolling through James Thompson’s @food_feels account to get some pizza, I mean, inspiration (sorry!) for this pizza, oh God, I mean, piece. And now, as you might have guessed, I am a little pizza. ARGH! I’m distracted. I am a little DIS.TRAC.TED. Thompson, an Aussie based in London, is (at time of writing) in Italy. Prior to Italy, he was in France. Before France, he was in Denmark. Previous to Denmark, he was in Portugal. Thompson’s accompanying #foodie photos are delicious. Let him whisk you away on a culinary adventure.